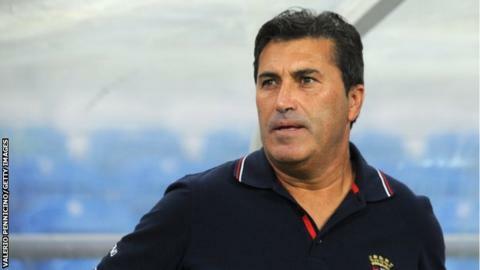 Egyptian club Al Ahly have appointed Portugal's José Peseiro as their new head coach. The 55-year-old replaces Fathi Mabrouk who was sacked after Ahly's exit from the African Confederation Cup when they lost to South Africa's Orlando Pirates in the semi-finals. Peseiro enjoyed a brief spell as assistant coach of Real Madrid under Carlos Queiroz in the 2003/2004 season. He then had coaching spells across Europe and in the Middle East. Peseiro was most recently coach of UAE side Al Wahda. He will take up his position as Ahly's head coach after their Egyptian Super Cup against the double league and Cup winners Zamalek. The match is set for 15 October at Al Ain's stadium in the United Arab Emirates. Former player, Abdel-Aziz Abdel-Shafy - known as Zizo - was made Ahly's interim coach following Mabrouk's sacking and will remain in charge of the side for the Super Cup fixture.